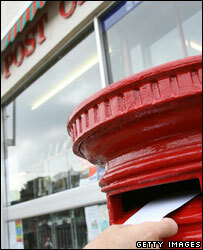 About 2,500 post offices - a fifth of those left in the UK - are to close by 2009, the government has confirmed. Trade Secretary Alistair Darling said he wanted to guarantee "reasonable access" throughout the country but the current network was "unsustainable". He said 4m fewer customers were using post offices every week than two years ago and they were losing £4m a week. Opposition parties say further closures will devastate local communities, particularly in rural areas. More than 4,000 post offices have shut in the past eight years. The next round of closures, with £1.7bn of investment from the government, would contribute to a sustainable network, Mr Darling told MPs. The network has been affected by new technology and "changing lifestyles", he said. Pension and child benefits can now be paid directly into bank accounts while TV licences, driving licences, passports and tax disks are now being supplied online and through other retailers. However, Mr Darling said the loss of that business was off-set by its reach into other areas. Post offices were the largest provider of foreign currency and the third largest provider of travel insurance, while its saver accounts have over £1.8bn in deposits. He also announced that broadband will soon be offered by post offices in a deal with BT. "Although the proposals I'm confirming today will lead to the closure of about 2,500 branches, the remaining post office network will still be larger than all the UK's banks and building societies put together. "Because we want to maintain a national network, we're putting in place rules that will provide for reasonable access across the whole of the country. "And we will give Post Office Limited the ability to shape the network for the future with clearly defined access criteria to ensure that the right post offices are in the right place to maximise their business." He said there will be a series of "local area reviews" during the next 18 months in 60 areas, each covering several constituencies. There will also be 500 "outreach locations" set up in small remote communities, in community centres, village halls, pubs and even people's homes. There have been 2,500 responses from pressure groups and individuals since the consultation process was ordered in December last year. Shadow Industry Secretary Alan Duncan said the proposals were not good news for the future of the post office network. "I'm afraid this statement confirms many people's worst fears that our Post Office network is about to be decimated. "This government already holds the record for closing Post Offices faster than any other and today's announcement amounts to an acceleration of that rate of closure, shutting a further 2,500 branches over the next two years. "By the time of the next election this government will have closed over one third of the entire Post Office network." Liberal Democrat trade spokeswoman Susan Kramer said the closures would be a "death knell" for many communities. She criticised the consultation for being "brief and unwieldly". She also asked for a commitment from the government that no more government business will be withdrawn from post offices, as well as saying that some small communities could lose their only shop with the closure of the post office located in it. The new SNP Scottish cabinet said it "deplored" the decision to close the post offices, and hoped a ministerial statement would be made to the Scottish Parliament on the issue next week. Why are post offices closing? What impact will closures have?